£700, excl VAT, self-catering. Chef available on request. Shorter lets by agreement. Driven grouse £155 per brace incl hospitality; grouse over pointers £125 per brace; stags £450; Macnabs £1,000; salmon £25-£110 per day per rod (maximum eight rods); all sport prices excl VAT. A traditional Scottish sporting experience in unspoilt surroundings – the new owner even buried electricity cables to keep the landscape unsullied. Just 30 miles from Dundee airport, the 15,000-acre estate is situated at the head of Glen Prosen and sport can be enjoyed in wilderness. 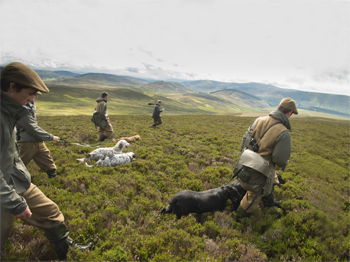 Grouse can be driven or taken over pointers, stalking for red stags is available and salmon-fishing is on a two-mile double-bank stretch of the Tay at Glenprosen’s Kercock beat.